This moist, scrumptious Chocolate Mayonnaise Cake was popular when I was growing up. We got past the ewwww factor of the mayo once we took our first bite! It’s seriously one amazing cake! 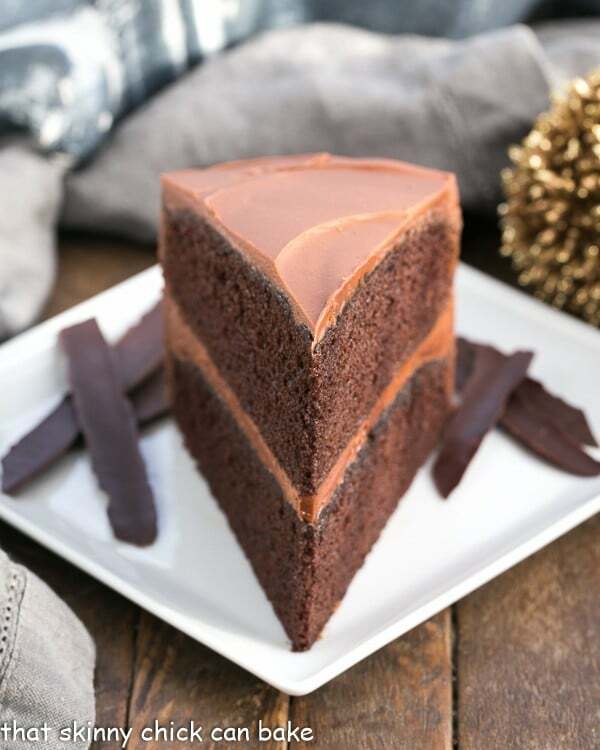 This scrumptious retro chocolate cake is perfect for all the chocoholics in your life. The unusual ingredient can be our little secret! My mom wasn’t one for fancy desserts unless it was for a special occasion. 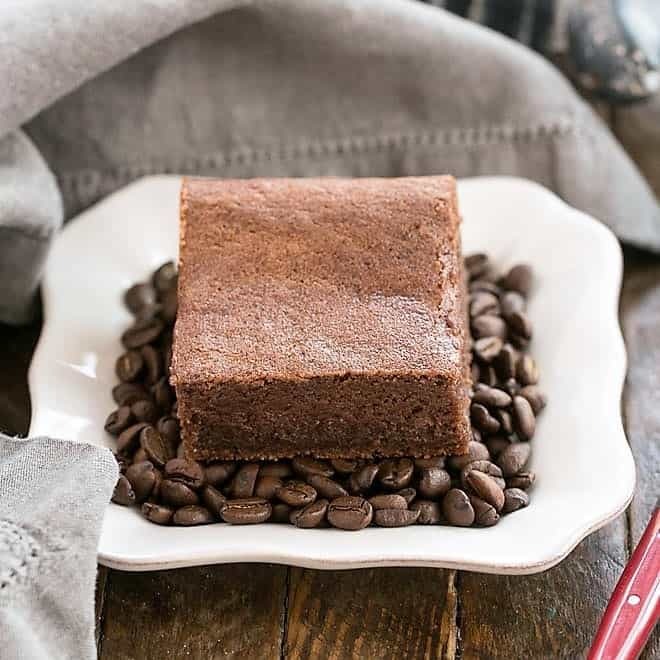 When she baked this chocolate mayonnaise cake, it was in a 9 x 13-inch pan. 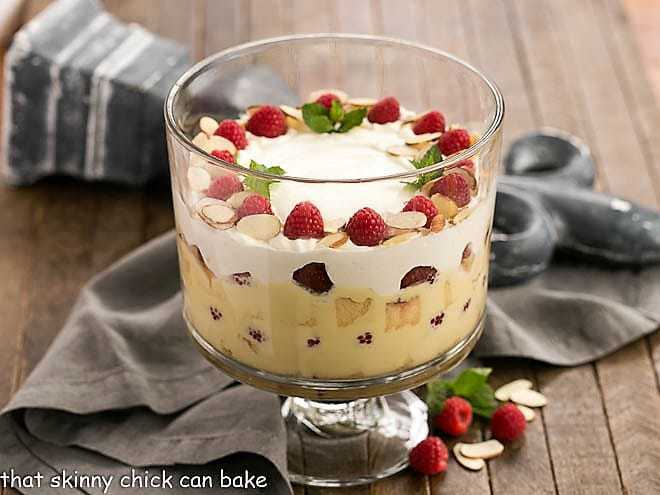 Simple, yet decadent and irresistible! The magic “mayo” helps add the moisture that many chocolate cakes are lacking. When I pulled my cake out of the oven after 30 minutes, I was certain it was over baked and would be dry. I usually check the cake before the timer goes off, but apparently, I was distracted. Rest assured, it was declared terrific by the whole family and the neighborhood chocoholic who relayed that it was the best chocolate cake he had ever had (via his wife who left me a glowing review via voice mail). Not a single soul thought it was dry, despite that it could have come out of the oven at the 28 minute mark. Why Add Mayonnaise to a Cake Recipe? You must remember that mayonnaise is made of oil, vinegar and egg. Each of these components offer their own benefits to the texture of a cake. No wonder this chocolate mayonnaise cake is so incredible!! 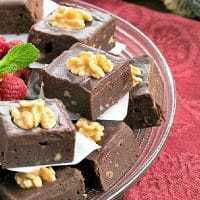 The oil makes a cake moist and tender. Check. We want that! The vinegar helps accentuate the chocolate flavor. Check. Who wouldn’t want that in a chocolate cake??? And, finally, the egg helps the batter retain moisture. Yes, no dry cakes wanted! PRO-Tip: Plus, all of the above (moisture, tenderness and intensified chocolate flavor!) can be obtained with just a measuring cup full of mayo. Please use a good name brand, like Hellmann’s, for the best results! I’m frequently asked how to cut a perfect slice of cake. Today, I’ll reveal all my secrets! Next, I wiped the knife dry with a clean cloth or paper towel and cut the cake with a sawing motion. I reheated and dried the knife for the second cut, making sure both cuts met at the center. I used a metal spatula to remove the slice. Voila! Note that the cake will taste better served at room temperature, but slices better cold. 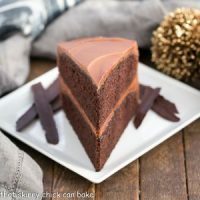 A retro chocolate layer cake that has stood the test of time! Let cakes cool about 20 minutes, then remove to cooling racks (remove parchment if it’s stuck to the cakes) to cool completely. OMG what a brilliant cake with mayo!! That looks incredible! And what a perfect slice! Last night, I was craving chocolate cake. I rarely crave cake. (I know, I know.) And then, I wake to this. IT’S A SIGN. I have never seen a slice this perfect! Great job Liz Berg! I need this cake in my life! Yum, it looks absolutely amazing. Your cake looks amazing! I have a very old, yellowed and splattered, mayonnaise chocolate cake recipe that is similar. 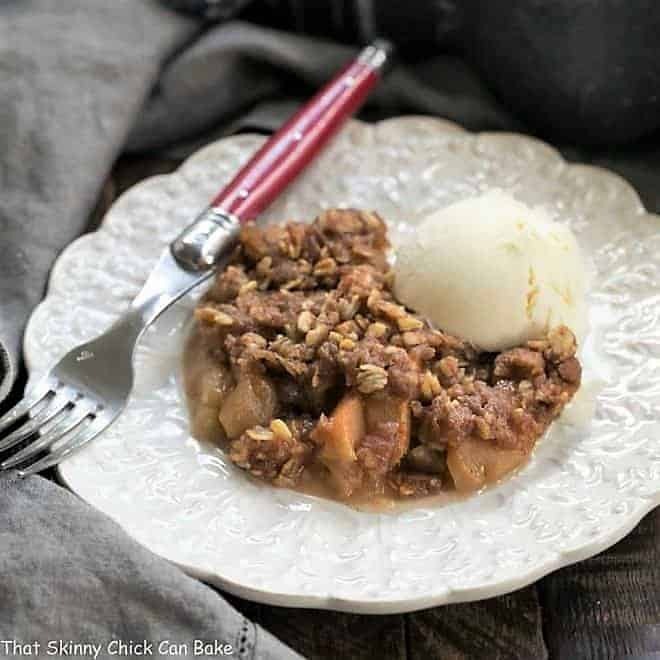 It’s time to make this again using your recipe (I like that it has coffee as an ingredient). Your slice is perfect as always – thanks for the tips. Gotta try it next time!! You read my mind; I was staring at the perfect slice wondering how to do it! We are in birthday season at our house so you’ve given me hope for something sort of as perfect as yours! This cake sounds so delicious Liz! 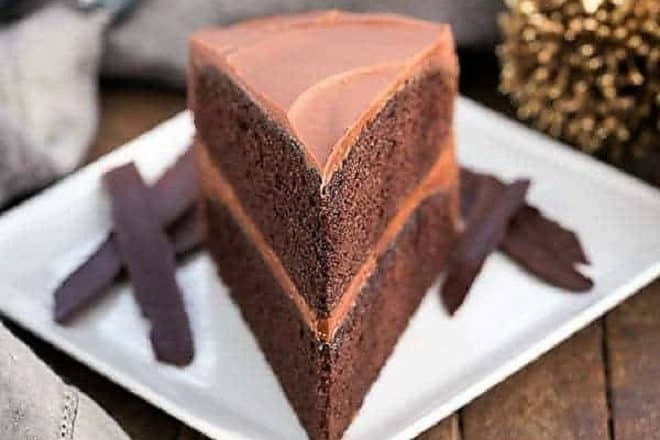 This chocolate cake looks so delicious! This combination of chocolate and mayonnaise sounds very challenging, can’t wait to taste it, Liz! I have use mayonnaise to bake cake, but years and years ago…thanks for the reminder…your cake is sure perfect…texture and all.. It looks delicious, Liz! I forgot all about mayonnaise cakes but remember how good they were. Thanks for the great tip for slicing and wish I’d known it when we were trying to slice our grandson’s birthday cake Sunday! Have a great rest of the week! Gorgeous Liz! I’ve never tried it with mayo, so I’ll have to try it! Wow this is just the perfect slice! It looks amazing. That is one GORGEOUS chocolate cake! Liz, I love hearing the technique for cutting a cake–super helpful! Mayonnaise in a chocolate cake? I have never had chocolate mayonnaise cake, Liz. But I am sure I would love this beautiful and delicious cake. Get technique for cutting the perfect slice of cake! I read a food stylist book a couple of years ago, and the stylist said she always cut the cake into wedges (for the slice), then applied the icing – – in essence building each cake “slice”! Your way is much more practical. 🙂 Anyway, this looks luscious — thanks. Wow! That dish looks so tasty! delicious. Thanks for sharing. I saw that slice on instagram, looks phenomeal slice and photo. Oh I made a cake with mayo years ago, was very good so sure this is wonderful. Great tips to cut a slice of cake! OMG it is awesome.. What a perfection!! Love it!! Mayo!?!? Mind blown! Can’t wait to try! That is a perfect slice Liz, I must try your tips next time. I alway make a mess of slicing cakes. I must try a mayo cake, it definetly intrigues me. This cake looks amazing!! I’m a big fan of mayo in cakes, and that slice looks divine! 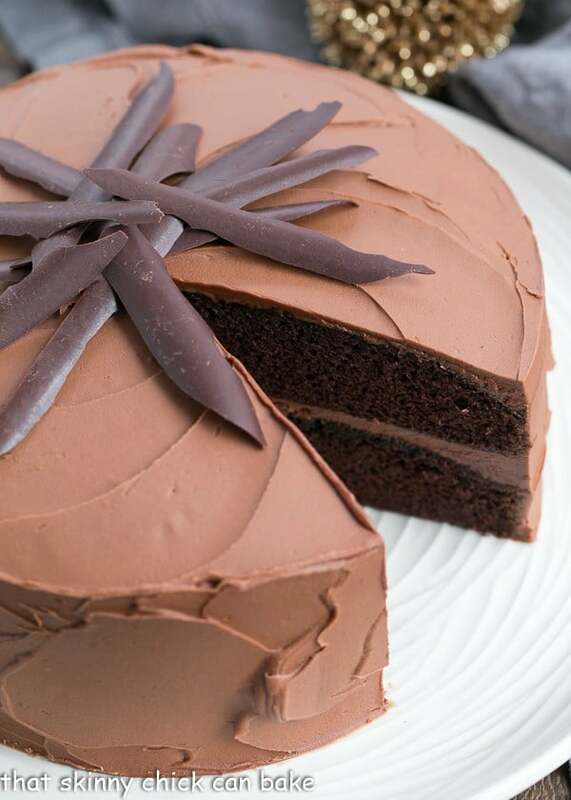 This cake is a chocolate lover’s dream and your slice is truly perfect! 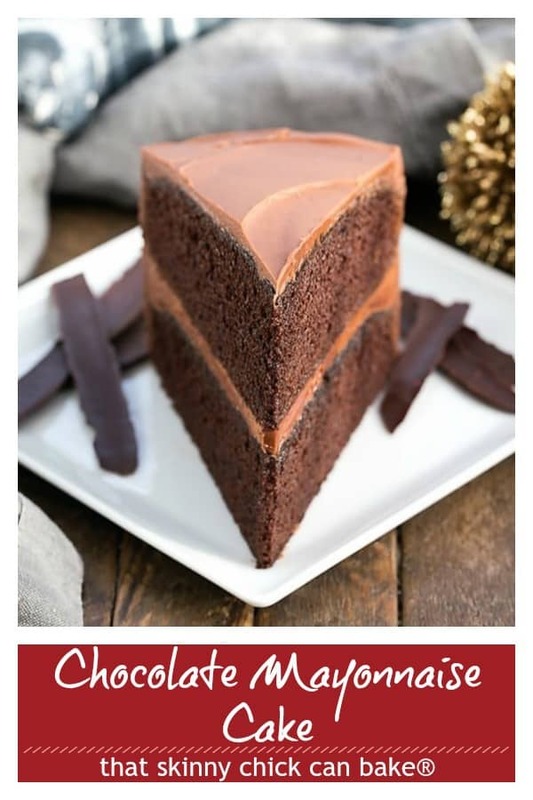 So much chocolaty temptation, thanks for the shout out ~ pinning and sharing! I adore chocolate cake and I remember this one! What a winner. And so is that slicing technique! What a gorgeous cake!!! I also liked your instructions on how to get a good looking slice of cake. 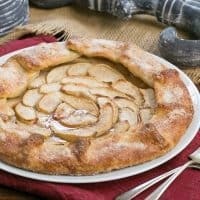 This is one of those heirloom recipes that has stood the test of time! Your method of slicing cakes and bars make for the most beautiful presentations! I’ve come across several mayo cake recipes but this is the one I’d most like to try. We have never-ever tried adding mayo in any dessert. But thinking this over, there’s no reason not to. Of course we trust your taste and your baking expertise and we’ll give it a try! reminds me of my mom,, she made many cakes growing up like this one. Yours really put a smile on my face with awesome memories.. Happy Sunday! 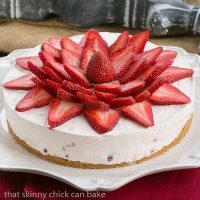 Reminds me of my mom, hers wasnt anywhere near as pretty would she make this mayo cake and is on the top 2 of my all time favorites this is picture perfect! I have never heard of mayo in a cake before but I am definitely curious about it. I imagine it knocks the moisture of this cake out of the park! That is one gorgeous looking chocolate cake! This cake is so moist and delicious! My kids request this all the time! Mayonnaise cake is a retro dessert worth preserving. SO chocolaty and delicious! This cake was really amazing! I made it for my son’s birthday and everyone loved it! All I can say is. YUM!! 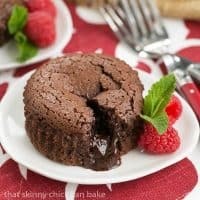 This is everything you want in a chocolate cake! It’s amazing how well the mayo works in this cake! Yum! I would love to try it! How long would you bake for cupcakes? I have not tested this recipe with cupcakes, but usually they take approximately 20 minutes. You can always bake just one cupcake as a test to see how long it takes, and how full to fill the cupcake liner. Let me know how it goes! I am not going to lie, I was skeptical at first. But this cake is so delicious! It’s unbelievably moist, thanks to mayonnaise!